Download Double Denim now for only £4.79! You can view photos from the album recording sessions in the photo album on Joe’s Facebook. 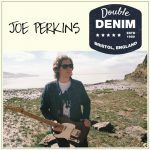 Joe Perkins: Electric, acoustic, 12-string and classical guitars; mandolin, acoustic piano, keyboards & synthesisers, banjo guitar, tin whistle, tenor recorder, xylophone, bodhrán, auto-harp, alto saxophone, pots & pans, jaw harp, additional tambourine and cowbell. John O’Reilly Jr: Acoustic drums, tambourine, lap-slaps, shakers, spoons, loop programming and general awesomeness. Jessica Crabtree: Fiddle on Perky’s Asylum. Emily Burridge: Cello on Table For Two. Vicky Flint: Trumpets on Let The Rain Fall. Sir Jonathan Weldon Esq: Words of wisdom on Perky’s Asylum. Frankie’s acoustic guitar, mandolin, ukulele, electric guitar and Ryan’s cajón recorded at Tyrone School Of Music, Dungannon, Ireland. John O & Papa Bear for being the best rhythm section I could have ever hoped to have behind me, and all of the other BRILLIANT musicians I’ve worked with on this record (you all RULE! ); Reuben G for his superb and vibey mastering trickery; my family for putting up with my noise & filth; my awesome friends for sticking by me despite my rants, mood swings & misery; the magnificent nurses and cardiologists in the Bristol Heart Institute for looking after me when I conked out last year; Platform One College of Music; Mike Devine for fixing all the stuff I break; Bare Knuckle Pickups for winding me some truly awesome magnets; Hughes & Kettner for building all the amplifier I could ever need; Steven Slate & Fabrice Gabriel for coding the best plugins I’ve ever used; The Harbour Bar, Bray; Dan & Mick at That Pedal Show for teaching me so much; Shaun & Debs at Wight Rock; and Flat Eric for overseeing all I ever do in the studio. Oh, and Tom Waits – just for being you. Boom Crash Drum Tracks – John O’Reilly Jr. recorded drums for the album remotely from his studio in Pennsylvania, USA. He’s a fabulous player, a top engineer and a true pleasure to work with. Mojito Mastering – Reuben Ghose runs Mojito Mastering in Toronto. He masters primarily with his outboard Chandler EQ & Limiter units – and he really knows how to use them! Jessica Diamond – I’ve known Jess Crabtree (aka. Diamond!) since I was about 5. She’s a tremendous violinist, saxophonist, singer…an all-round super-talented lady!! Vicky Flint – A great session trumpet player who has played with everybody who matters. Emily Burridge – Wonderful cellist, arranger & engineer who also plays in some really interesting collaborative projects. Tyrone School Of Music – My buddy Frankie runs this awesome music college just out of Belfast where he also records local bands. That Pedal Show – Weekly videos on YouTube featuring (the genius!) Dan Steinhardt and Mick Taylor. If you’re a serious guitarist, watch every single video – they’re completely invaluable. Slate Digital – the best analogue gear-modelling plugins out there, bar none! Great companies making awesome, inspiring gear: Hughes & Kettner, Bare Knuckle Pickups, Wampler Pedals, Jam Pedals, Loop-Master, sE Electronics and Schoeps.